This is a great answer to Nathan's post, thank you! I think that a lot of people get offended by questions like Nathan's because they think he's saying they're not good writers or something silly like that. Like if it's just a hobby, you're no good at it. Well, I think they're wrong. I avoided the drama over there (plenty in my own home, thank you) so appreciate the wrap up. It allowed me to get a feel for the discussion w/out the hub bub. What makes me what I am? My God, my family, my art. One is not exclusive of the other -- they are beautifully intertwined. And, thanks for the complement on the photo. It has been 18 sweet years of marraige and I am truly blessed! Great insight, Wendy! Such deep thoughts! God gifts us each with varying abilities and talents. He expects us to use those talents for him. That's what should define us, how we use what he's given for his glory. Ultimately we'll have to stand before him (like the men in the parable of the talents) and give an account for what we did with what he's given us (including time, family, spiritual gifts, and other gifts). I'm truly enjoying the interaction that we get to have every day through our blogs! I appreciate your thoughts and encouragement! Thanks! My simple litmus test-defining question: Becca, are you content writing? Yes. I work and work and work, hence I'm a writer. Wendy, I'm not familiar with Nathan, but I thank you for bringing this concept to my attention. It's so true that we can define ourselves by any one thing, but I think it's only natural that when we're wearing a certain hat, we tend to ramble off the most relevent thing to it that aids in defining who we are. When I'm in the kitchen, for instance, I might say that I'm a "family type cook", when I'm in the gardens and talking to a nursery owner I may define myself as an "amateur gardener". So, obviously, when I'm speaking with book professionals or other writers, I'm going to define myself as a "writer". In neither of those cases am I ever only the one thing. But I draw one particular aspect out of my life that seems pertinent to whom I'm talking with or the situation I'm currently in. It's dangerous to be narrow-minded, and think that those who define themselves to you aren't a whole lot more. Not only dangerous, but rather ignorant in my opinion, too. I doubt that Nathan meant it in such a way, though. Ooops, I meant to say that we can't define ourselves by any one thing. We are people, after all with many, many hats to wear in any given day. I have not read Nathan's post, but I will check it out. I think there is an important place between getting published and not. When people read your story (friends, family, strangers) and they comment then the story has some life. I guess that I feel like a writer because I have written a novel that people have read. Lady, we hold similar opinions. Good for you for commenting on the post. Tess, I hear ya about the drama. Beautifully intertwined indeed! Jody, for his glory, yes! I am understanding a new kind of friendship through blogging. Rebecca, I like how you involved the amount of work you do in your decision. Dave, I know what you mean about that place in between published and not. I still think you can call yourself a writer and not be published. But I get your point. I also agree having someone read your work helps bring it to life in a powerful way. Congratulations on the novel. I also have written one that was read by five cold readers and is in good hands right now...I remain hopeful. I confess, I was secretly pleased when some of the cold readers said my manuscript made them cry...Why? B/c it had impact, so I'm hearin' you. Curious too about your novel. Very nice post. :) I'm like you: writing is an integral part of who I am, but it isn't all of me. I went through 4-5 years without writing at all and lived. I'm still not sure how I did that, but I did. ;-) It's part of my identity (whether or not I ever get published), but not all of it. Maybe the trouble comes from people needing to categorize things. People tend to like to do that, and perhaps have taken it to an extreme. I think, in general, people are too complicated to be slotted into one category (besides gender). I'd like to say I identify myself first and foremost as a follower of Christ.... and although I do - I'm not sure this is evident to the people who surround me. Isn't that sad? I'm off to go read Nathan's blog now. Awesome post. What defines me? More than my writing-who I am to others, to my daughter to my husband and who I am in Christ as I live my life. 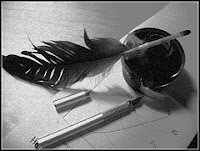 I love to write--I always have--and as you said, I will write whether I get more published or not. Lovely post. I agree with your sentiments. I feel that writing is less about me and more about what I have to offer. I want it to touch people, to make them laugh, to make them think about something in a new way. That's why I constantly prowl for writing tips and for ways to improve my writing. This is a thoughtful post and a debate I often pose to my writing students. Too many of us put way too much emphasis on labels and identity, forgetting who we truly are. I've been writing professionally for more than 20 years; am a member of American Society of Professional Journalists and Authors. But I still wrestle with what it means to call oneself a "writer." I do know that a surefire way to induce writer's block is to make the writing life too precious.